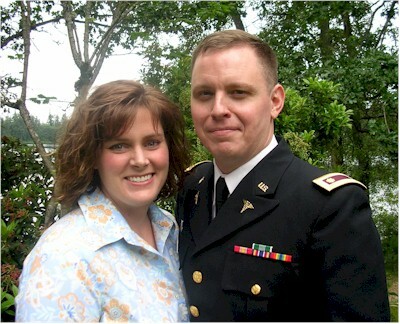 We spent the weekend celebrating our 12th Anniversary, graduation from residency and my promotion to Major. As Dad would say, a good time was had by all. This snapshot was taken immediately following the graduation ceremony last Friday. I have finished all of my clinical shifts at Madigan and the University of Washington and have only a handful of "community" shifts at the local civilian hospital left--we'll be on the road the last week of this month! Dad caught it, all 16 (and a half!) inches of it. He was in such a good mood for the rest of the trip it was hard not to take advantage of the situation! 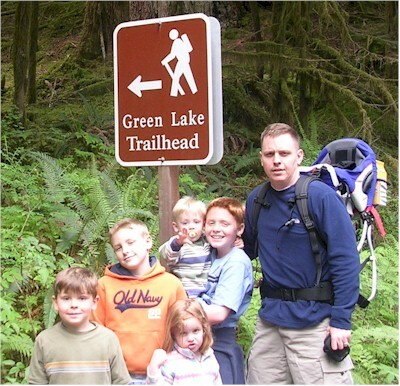 We spent Memorial Day on the trail to Green Lake. As our time is short in Washington we are anxious to get outdoors as much as the weather will cooperate. Mindful of the holiday, we had had the kids watch a documentary on the Battle of the Bulge the night before and Zachary--a very imaginative child, spent much of his time far away in the woods around Bastogne, lobbing grenades at German machine gun positions and (repeatedly) dying in a very heroic manner. His late Uncle Raymond, a veteran of that battle, would no doubt have been pleased to see the energetic, if not always historically accurate reinactment by his great great great nephew. More pictures below.